The audio guides are handy and it was worth it alone for not having to wait in line for enterance. You have approximately 4 hours to enjoy the palace and gardens. This was a fantastic tour. 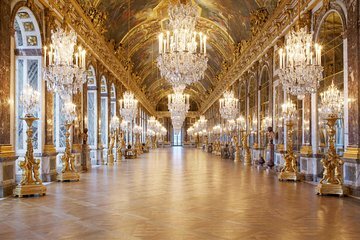 We had a beautiful tour bus take us for a fun visit to the Palace of Versailles, along with skip the line tickets, audio tour and detailed instructions for our return trip home. We enjoyed our day at the Palace very much (even my kids enjoyed it). Don't miss the opportunity to buy macaroons at Laduree inside the Palace. The food options at Versailles are limited (not the fault of the tour company), so bring food or leave yourself time to eat outside of the Palace. We didn't like the food at the Palace very much. The only reason I didn't give this tour five stars is because we found it mind-numbing trying to figure out where to pick up the outgoing bus was a bit of an ordeal. We questioned whether we were standing in the right pick up spot and only felt relieved when the bus finally showed up. It was on-time, but we worried and worried! We chose the pick up location near the Triumph D'Arc (they give you the option of three locations) and it's simply a spot at random street corner with no signage. Just put the address in your GPS and cross your fingers! BTW, the tour just allots for the bus ride, audio tour (provided by Versailles) and the skip the line tickets. Tour was organised perfectly met at the locations went to Palace short wait to get in but nothing compared to the lines that were there. Palace was amazing the grounds are fantastic. Electric carts can be hired to see more we walked had lunch near the canal as row boats went passed. Wonderful day out in Versailles! Well managed and fairly organized.